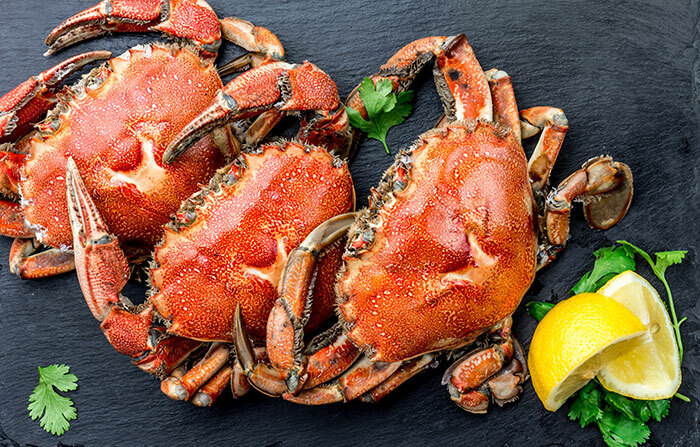 Famed for its incredible coastline, Queensland can also kick it with the best of ‘em when it comes to gastronomic prowess. Ashley Wright – aka Cairns born-and-bred blogger Foodvixen – tells us what’s on the menu in Australia’s Sunshine State. Love of food runs in my family. Both my mum and dad are killer cooks and Queensland’s incredible bounty of fresh ingredients has led to some legendary feasts. What’s more, for 35 years the family business was wholesale fish. 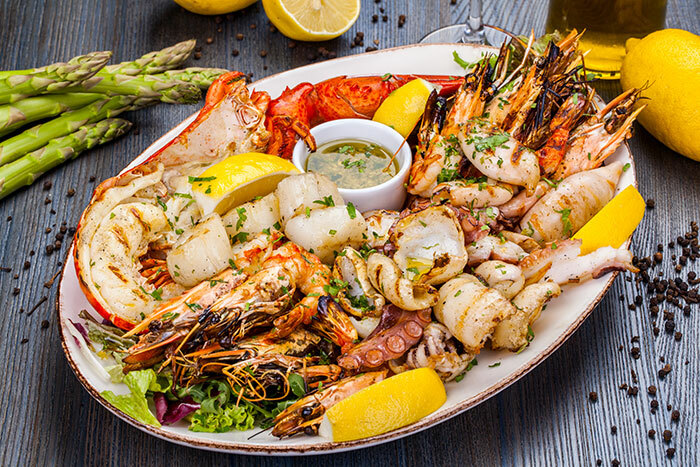 Seafood reigns supreme here, and it’s arguably the best in the world, from ocean-fresh prawns and spanner crabs to Hervey Bay scallops, barramundi and Moreton Bay bugs – a type of lobster with sweet meat in the tail. It’s no secret us Queenslanders love a good barbie and these just need a lick of heat and a dollop of garlic butter. From Moreton Bay in the south, off the coast of Brisbane, to the Tropical North, each region has a distinct identity, but the state is united in having fantastic food and drink and some of Australia’s best restaurants. 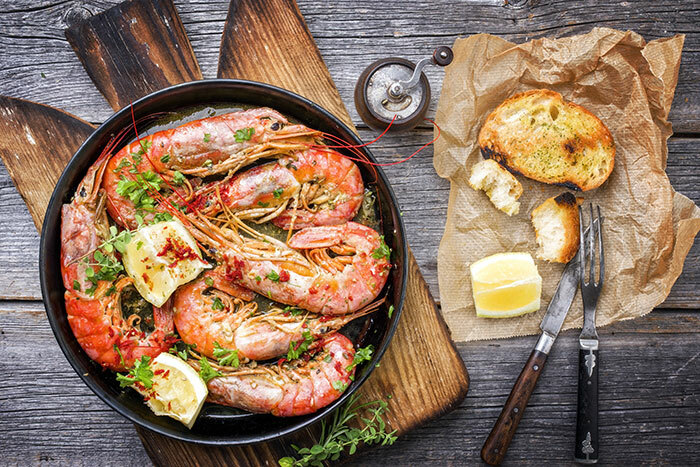 Head up the Sunshine Coast and stop at Sails, in gourmet Noosa, to tuck into Fraser Coast prawns while sipping rosé on its beachside deck. I live in Tropical North Queensland, the state’s ‘fruit bowl’, and we produce 95% of Australia’s bananas, as well as a ton of nuts, mangoes, lychees, pawpaw and pineapples. Try the best of the crop at iconic Rusty’s Market in my hometown of Cairns, where more than 180 stalls groan with produce. I went every weekend as a kid – my mum bribed us with juice from the Pineapple Man! This is where my parents had their seafood stall in the 1980s and it has a special place in my heart. Do it like the locals and visit on a Saturday morning for Annee’s Vietnamese coffee and a banh mi from the food bar. That said, you don’t have to look hard to find native ingredients on the menu at Queensland’s modern Australian restaurants, with the likes of lemon myrtle, Davidson plums, kangaroo and emu making appearances. In Cairns, head to Ochre Restaurant for grilled kangaroo sirloin with quandong chilli glaze. At the other end of the scale is traditional bush fare. Take the Daintree Dreaming Day Tour in Mossman Gorge, an hour north of the city, and you’ll learn about Aboriginal culture while seeking out mud crabs and fish, then tasting and sharing what you have caught and gathered. in the Atherton Tablelands. Does life get any better? The drive from Cairns to Port Douglas takes in one of the most spectacular coastlines in Oz, and Arabella’s is ideal for a breezy lunch. Tuck into a seafood tasting plate on the veranda, then take a stroll down Four Mile Beach. For cocktails, head to Barbados for its killer happy hour. And don’t forget to stop at the Rex Lookout for an Instaworthy shot! 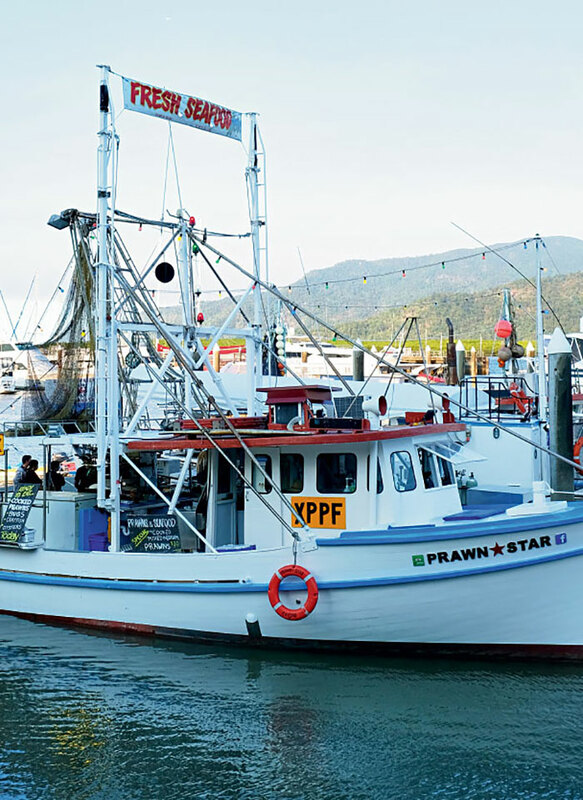 For seafood in Cairns, you can’t get much fresher than Prawn Star, a working trawler berthed at the marina with beautiful views across Trinity Inlet. Hop onboard, get to know the locals over a beer and a shared table, and stuff yourself with freshly cooked prawns. State capital Brisbane, with its vibrant music and arts culture, has a heap of five-star finds to whet your appetite. The most famous foodie market in Queensland is Eat Street Northshore (above), in the suburb of Hamilton. Try Moreton Bay bugs (slipper lobster) served street-food style – and at bargain prices – or ice-cream nachos. Airlie Beach is the gateway to the Whitsunday Islands, the Great Barrier Reef and the dazzling sands of Whitehaven Beach. Local institution Fish D’vine & the Rum Bar stocks a mighty 560 rums! Go for the Mojitos and stay for the chilli mud crab. 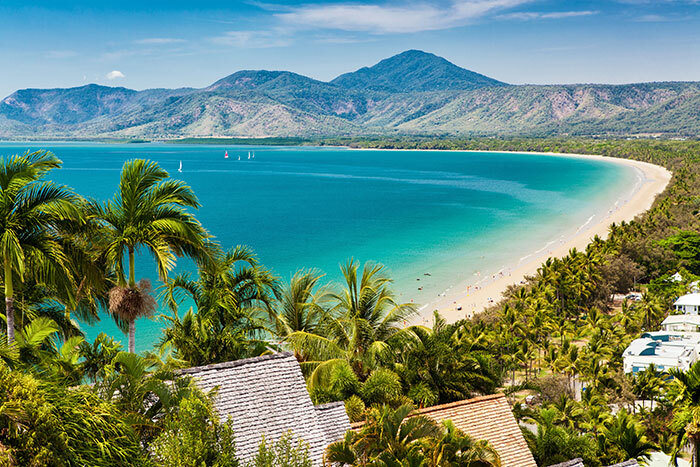 Connecting Cairns to Coolangatta, the Pacific Coast Way is a classic Aussie road trip taking in desert landscapes, dense rainforest and idyllic coves, such as Horseshoe Bay. Drive the scenic route and refuel more than just your car as you visit markets, beachside restaurants and roadside stalls, all showcasing regional delights. It has stunning beaches and national parks, but Noosa also has a thriving food scene. 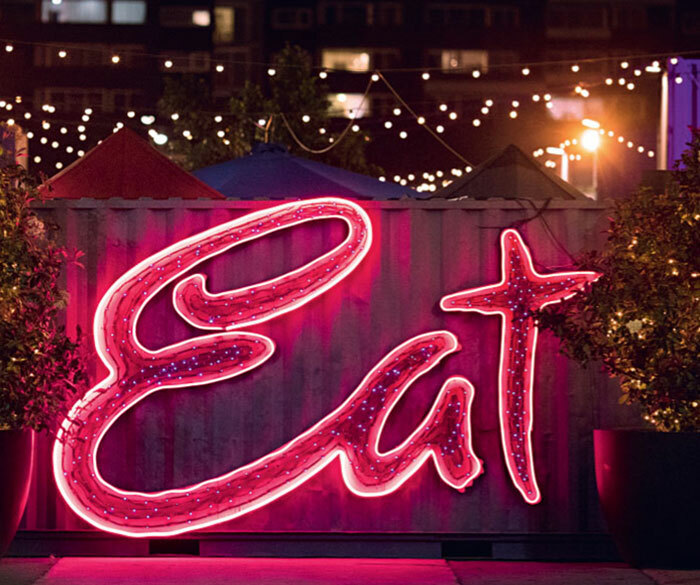 The annual Food & Wine Festival in May is a blast, but for year-round dining try Wasabi, named one of Australia’s best Japanese eateries by Gourmet Traveller, Locale for innovative Italian, Noosa Boathouse for fish and chips and Sum Yung Guys for pan-Asian fare. 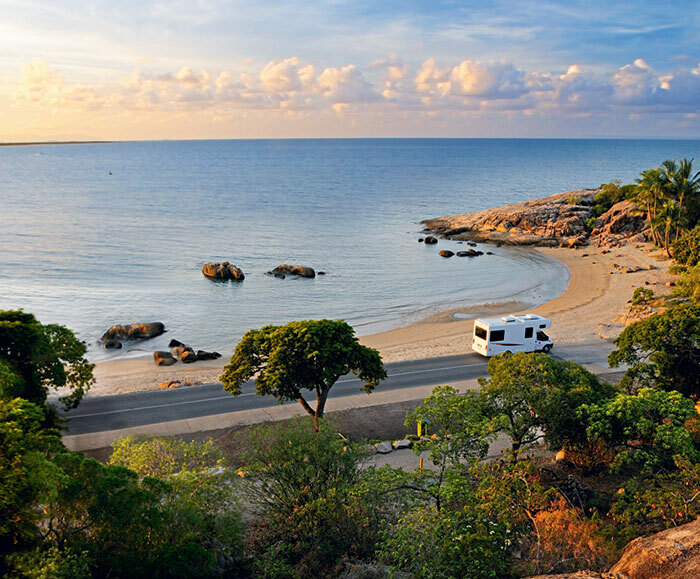 Choose our Queensland by Campervan Journey to explore Queensland at your own pace, taking in the state’s sights and flavours as you make your way from Brisbane to Cairns, or check out the rest of our Queensland holidays. Chat to a Flight Centre Travel Expert to start your tailor-made holiday today!